photo by Olson & Son Hopyard media director and CFO Karin. Hard at work brewing beer this weekend here is the Olson & Son Hopyard and Brewing crew, with assistant brewer holding on to the 30 minute hop addition of .75oz of Chinooks. Just a quick not to remind everyone that today is the final day for orders of your very own Olson & Son Hopyard t-shirt, until next year. Click this link to order. Thank you all so very much for your interest and enthusiasm for our little project. Every t shirt sale helps us not only keep this fun hobby going but more importantly helps us maintain Liam’s medical equipment and needs. Your generosity has floored us all and I am so happy that so many of you have joined in the fun. I can’t tell you how much it cracks me up that in about three weeks people all over the country will be rocking their O&SH gear. 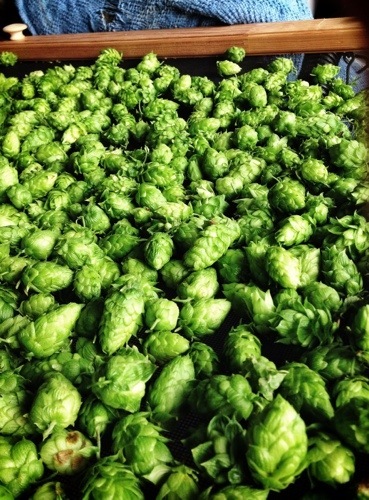 This morning I posted this picture of my Willamette hops to Instagram. Aside from maybe a shot here or there during brewing this fall it will be the last picture of the hopyard’s season. Which for me is kind of sad. Four years ago when I planted four rhizomes (one variety didn’t make it) the last thing I expected was for dozens of people all over the country to eventually start interacting with me in so many different ways. 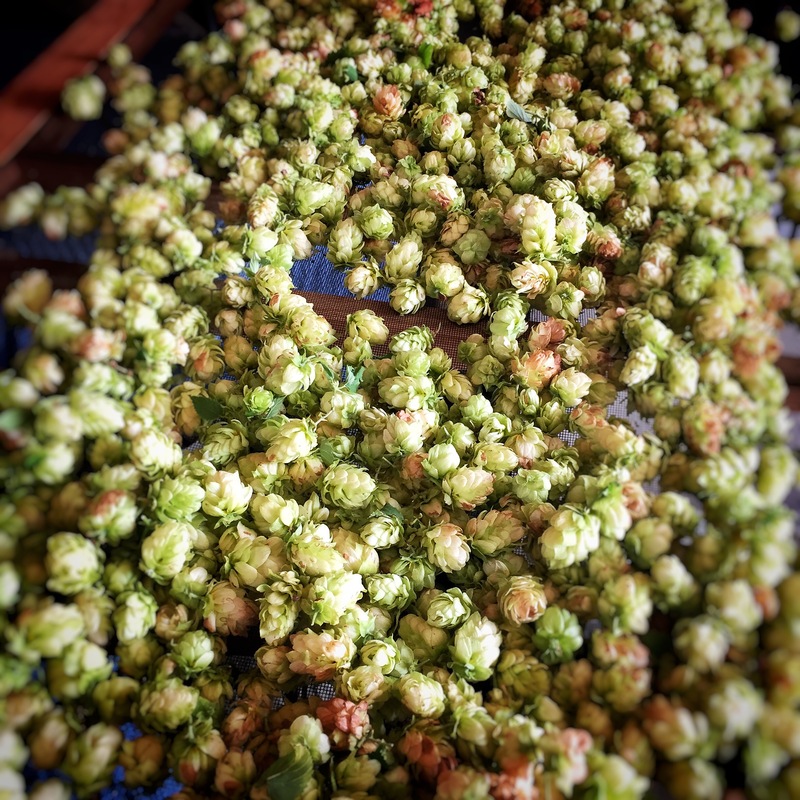 But in taking so many pictures of the Hopyard year after year a strange overlap occurred between parents of children with complex medical needs and disabilities and hop farmers, homebrewers and even some professional Brewers. 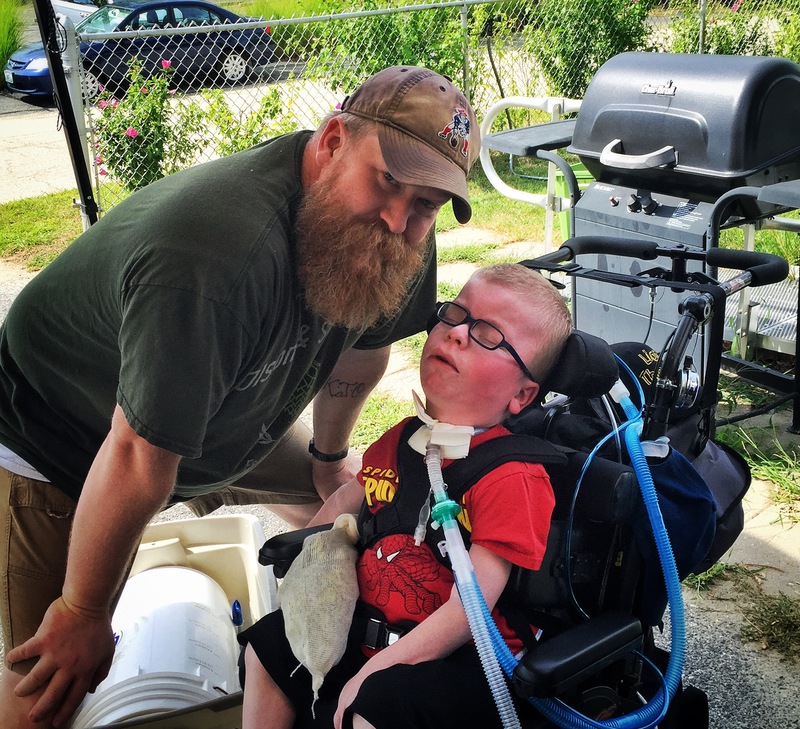 What’s funny is that now I get questions from homebrewers and other beer folk about Liam, and questions from special needs parents and other medical folk about beer. It’s a special little community you’ve all created, and I couldn’t be more proud or humbled by it all. So when I decided to sell Hopyard t-shirts and set a goal for printing 50 of them I wasn’t exactly sure we’d make it, despite Karin’s assurances. As usual though, she was right, and I was wrong. Within 36 hours 50 shirts had been ordered fairy teeing a printing of as many as we can sell. What amazed me more than the amount though was who was buying. People we have never met before. Some were from people that didn’t even follow me on social media but had heard about the sale on Facebook or from some big hop farms who had seen the sale because of a hashtag and passed it along. The Olson & Son Hopyard shirts aren’t only going to friends and family. These shirts are going all over the country, to be worn by homebrewers, hop farmers, and special needs families all over the place and it absolutely has blown my mind. Thank you to all of you out there who have ordered, and Thank you to all of you who have shared. There are 5 days left to get one these beauties. They make awesome gifts, look pretty sweet and once this sale ends they won’t be sold again. If you are able, and you enjoy the content I share here on the blog or on Twitter, and Instagram, Please help support the Hopyard and help us support the medical equipment costs associated with Liam’s medical needs by sharing this link far and wide before September 1st. The Olson & Son Hopyard staff aren’t just here in Riverside Rhode Island. They’re everywhere that have heard of Liam, and everywhere that like to see my photos of growing a backyard hopyard. Sandwiched around a very pleasant and relaxing trip to New Jersey, so that Liam could see his grandparents and so that my father-in-law could take his daughter to a Yankee game again, it has been harvest time here at Olson & Son Hopyard. Pictured are some of today’s pickings. Newports, to be more specific, drying in the garage. It’s been a busy week. I’ll return to my normal sporadic posting soon enough.